These migrations were seasonal or temporary. Most Irish migrants were young men working on contract for English merchants and planters. They served for a summer or two, occasionally longer, and then went home. It was a substantial migration, peaking in the 1770's and 1780's when more than 100 ships and 5,000 men cleared Irish ports for the fishery. The exodus from Ulster to America excepted, it was the most substantial movement of Irish across the Atlantic in the 18th century. In the late 1600s, ships from the English West Country travelled to ports along Ireland's south coast to collect food and servants for the transatlantic fishery. Map by Tina Riche. ©2001 Newfoundland and Labrador Heritage Web Site. Based on information provided by John Mannion. Virtually from its inception, a small number of young Irish women joined the migration. They tended to stay and marry overwintering Irish male migrants. Seasonal and temporary migrations slowly evolved into emigration and the formation of permanent Irish family settlement in Newfoundland. This pattern intensified with the collapse of the old migratory cod fishery after 1790. An increase in Irish immigration, particularly of women, between 1800-1835, and the related natural population growth, helped transform the social, demographic, and cultural character of Newfoundland. In 1836 the government in St. John's commissioned a census that exceeded in its detail anything recorded to that time. More than 400 settlements were listed. The Irish, and their offspring, composed half the total population. 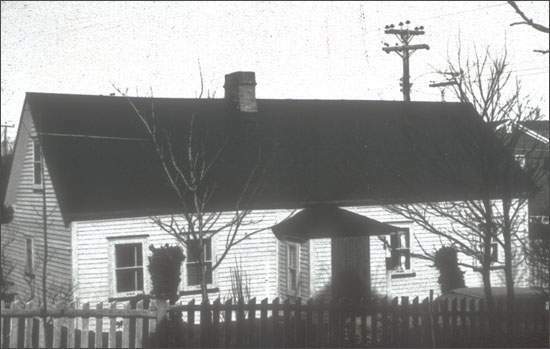 Close to three-quarters of them lived in St. John's and its near hinterland, from Renews to Carbonear. There were probably more Catholic Irish concentrated in this relatively restricted stretch of shore than in any comparable Canadian space. It was the outcome of a long and complicated process. Cramps Irish Farmhouse, Freshwater Road, St. John's, n.d. When the Irish came to Newfoundland many settled in St. John's and its near hinterland. Reproduced by permission of Dr. John Mannion, Memorial University of Newfoundland, St. John's, NL. Photo ©2000. The vast majority of Irish came from Waterford and its hinterland, up to 30 miles from the port. They came specifically from southwest Wexford, south Carlow, south Kilkenny, southeast Tipperary, southeast Cork, and county Waterford. The only notable pocket of migration outside the southeast was around Dingle, in distant Kerry. No other province in Canada or state in America drew such an overwhelming proportion of their immigrants from so geographically compact an area in Ireland over so prolonged a period of time. Waterford was the primary port of embarkation. Most migrants came from within a day's journey to the city, or its outport at Passage, six miles down river in Waterford harbor. They were drawn from parishes and towns along the main routes of transport and communication, both river and road, converging on Waterford and Passage. The ancient Norse city port was at the centre of an elaborate network of trade routes where produce from its rich farm hinterland was assembled to victual this faraway fishery, and where passengers gathered each spring. New Ross and Youghal were secondary centres of transatlantic embarkation. Old River ports such as Carrick and Clonmel on the Suir, Inistioge and Thomastown on the Nore, and Graiguenamanagh on the Barrow were important centres of recruitment. So were the rural parishes along these navigable waterways. Probably the principal motivation for migration was economic distress in the homeland. The population almost doubled between 1785-1835, the main period of emigration. Land scarcity, unemployment, underemployment, and the promise of higher wages attracted young Irishmen to the fishery. Most migrants were between 18-25 years old. Some were the surplus sons of small but viable farmers unwilling to subdivide their holdings, others were laborers on large and middle-sized farms. A substantial minority were artisans or apprentices, mostly from the towns and ports. Irrespective of economic or social origins, almost all Irish moved primarily to better their economic lot. 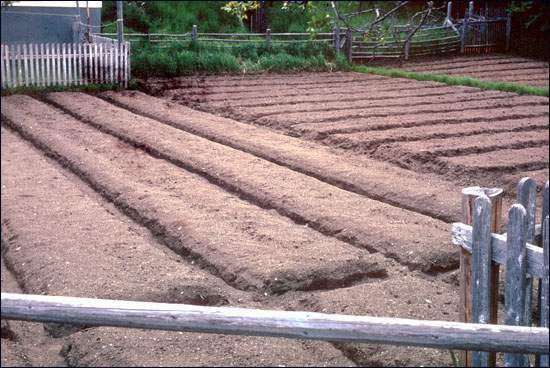 Potato Beds Ready for Seeding, n.d. Potato beds were, until recently, a common site in Irish Newfoundland communities. In Newfoundland they created a distinctive subculture through the 18th century that is still evident. Almost all were Catholic. Many spoke only Irish on arrival, or distinctive varieties of English. Elements of material culture - agricultural folkways, vernacular and ecclesiastical architecture, for example - endured to this century, and trace elements remain. But the strange new world of a commercial cod fishery, a harsh winter climate, and the presence of so many English transformed their lives; their descendants emerged as fully-fledged Newfoundlanders, a unique culture in modern North America. For other related articles view the Irish section of the Society and Culture Table of Contents.